A Russian Soyuz capsule carrying a three-man crew from Russia, the U.S. and Italy touched down on the frozen steppe of Kazakhstan on Thursday after 2,224 orbits of Earth over a mission duration of 138 days and 17 hours as part of International Space Station Expedition 52 and 53. 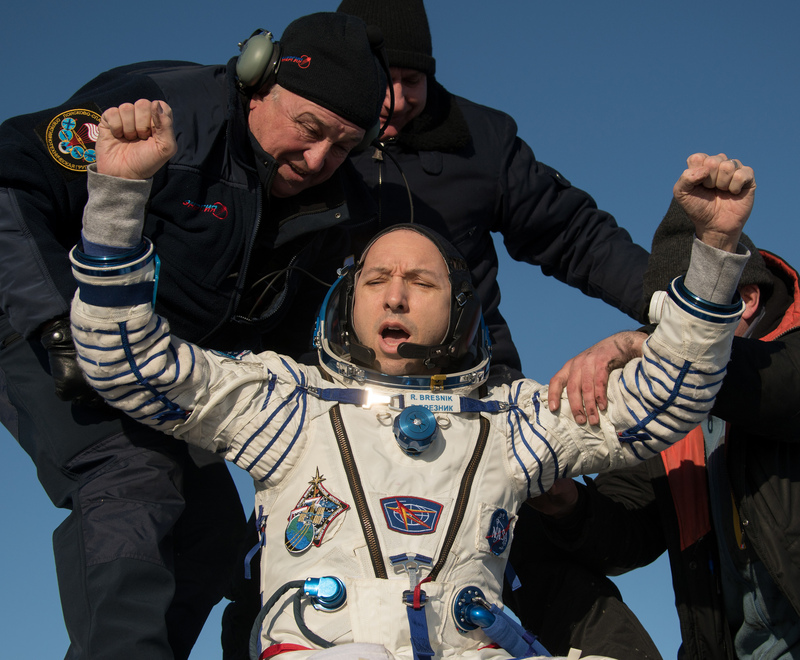 Parachuting into the dead of winter, veteran Cosmonaut Sergey Ryazanskiy, NASA’s Randy Bresnik, and third-time space flier Paolo Nespoli were greeted by temperatures of -17°C when recovery specialists opened the hatch of the landed space capsule. Closing out a four-and-a-half-month, 94.7-million Kilometer mission, the international crew trio loaded into their Soyuz MS-05 spacecraft and closed its hatch a 2:02 UTC, setting in motion the final preparatory steps for the spring-loaded separation of the seven-metric-ton spacecraft at 5:14 UTC. 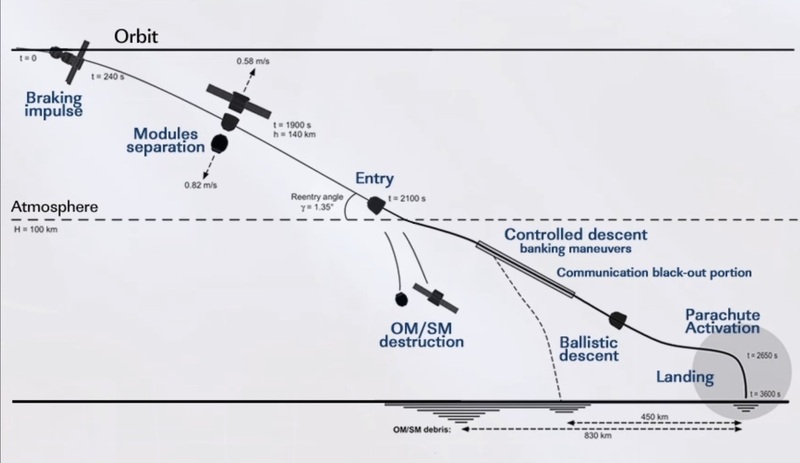 Soyuz fired its thrusters to speed up its departure and open a gap ahead of a rocket-powered braking maneuver at 7:44 UTC that placed the spacecraft onto a downward arc for a blazing re-entry 30 minutes later to begin the process of slowing down from 7.6 Kilometers per second to a complete stop in just over twenty minutes time. 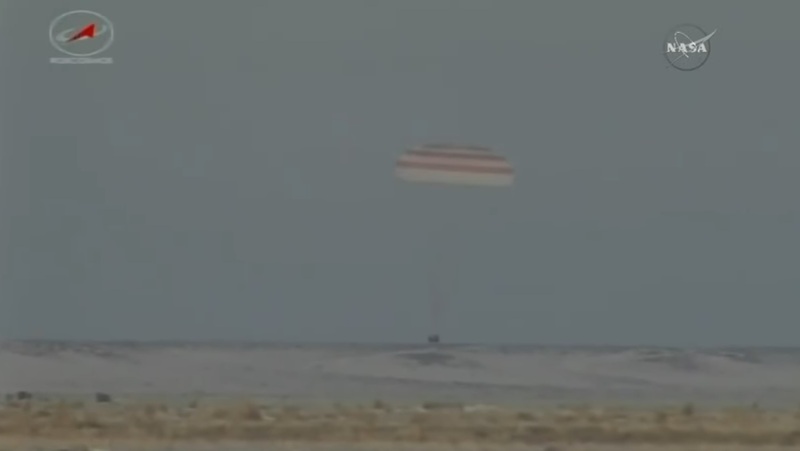 Deploying its huge orange-and-white main chute, Soyuz calmly swayed in crystal clear skies over the landing site in South-Central Kazakhstan. 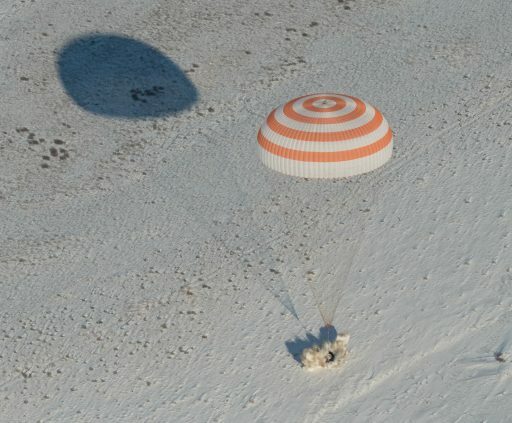 Soft landing engines fired moments before the spacecraft made contact with the snow-covered ground at 8:37 UTC, coming to rest in an upright position to mark the conclusion of the 134th Soyuz mission. 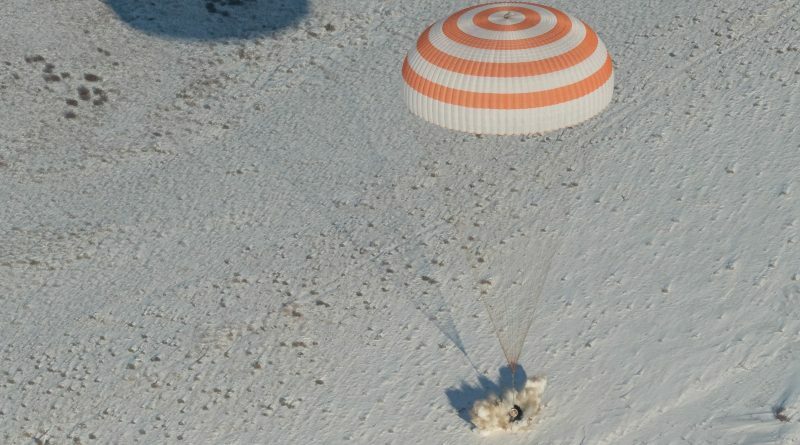 All three crew members were extracted from the small capsule within half an hour of landing and appeared in good spirits and excellent physical condition despite the exceptionally cold temperatures. Thursday’s successful Soyuz homecoming was only the first part of a rapid-fire crew rotation on tap for the International Space Station as a few hundred Kilometers west of the landing site, at the Baikonur Cosmodrome, the Soyuz MS-07 spacecraft is being integrated with its Soyuz FG rocket for liftoff Sunday morning. Third-time Soyuz commander Anton Shkaplerov, joined by rookies Norishige Kanai of JAXA and NASA’s Scott Tingle, will be faced with similarly cold temperatures for their 7:21 UTC liftoff. If all goes well, they will join the Expedition 54 crew on Tuesday via an automated docking maneuver. Soyuz MS-07 had originally been set for a same-day launch-and-docking on December 27 but schedules were changed on request of NASA to bring the launch forward to avoid having personnel in Baikonur or in transit over the holidays at the cost of losing the same-day flight profile and reverting to the traditional two-day rendezvous. Ryazanskiy, Bresnik and Nespoli lifted off from Baikonur back on July 28, departing Earth in a balmy summer night for a fast-track rendezvous with the International Space Station to join the Expedition 52 crew of Fyodor Yurchikhin, Peggy Whitson and Jack Fischer for a five-week handover. 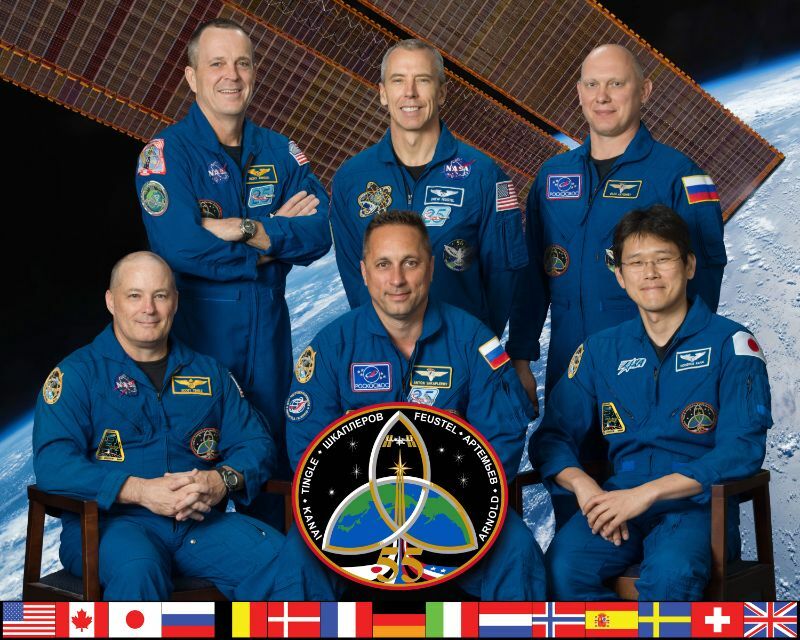 Over the course of their mission, the Expedition 52/53 crew supported over 300 active studies aboard the orbiting laboratory and oversaw the arrival of four visiting vehicles including Soyuz MS-06 with crew members Misurkin, Vande Hei and Acaba who completed the Expedition 53 crew. Four spacewalks, one on the Russian and three on the U.S. side, completed a variety of external outfitting tasks including repairs on the Space Station’s Canadarm2 to keep the critical robotic asset in working condition for vehicle captures and external maintenance. All three Soyuz MS-05 crew members proved to be avid photographers, taking hundreds of thousands of photos of Earth and life aboard the Space Station, some of which they shared with their Social Media followers for an inside look at life off the planet. 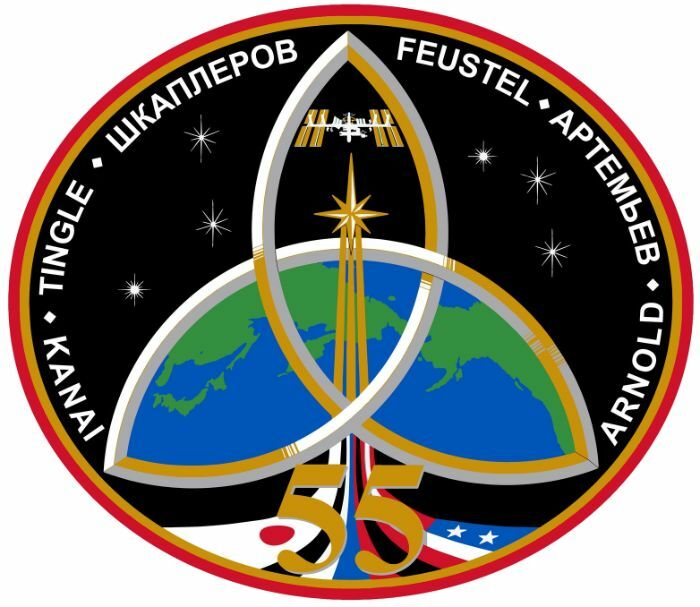 Gearing up for an eventful Thursday night homecoming, outgoing ISS Commander Randy Bresnik handed the reigns over ISS to Aleksandr Misurkin who will lead Expedition 54. The departing crew then caught some sleep before powering up the Soyuz MS-05 spacecraft for last checkouts and placing the final return cargo into its Entry Module before a final dinner in orbit as a six-person ISS crew. 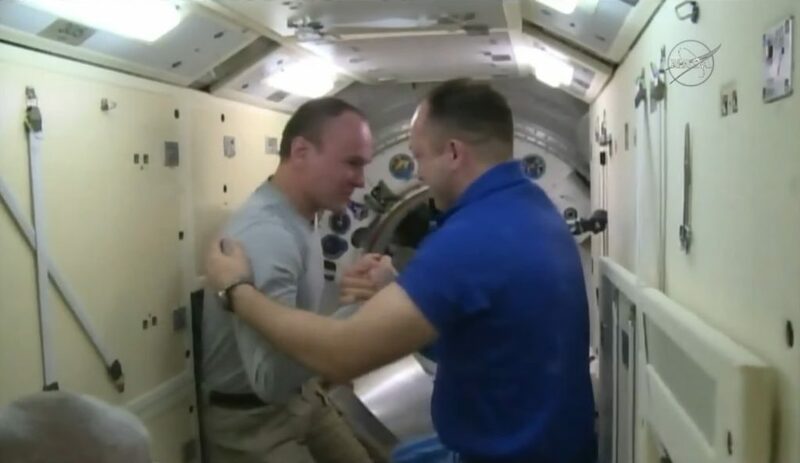 Bidding farewell to their crewmates and their home in space, the three departing crew members floated aboard their Soyuz spacecraft and sealed themselves off at 2:02 UTC when hatches on the Soyuz and Rassvet docking compartment were closed and locked to kick off the final three hours of undocking prep. 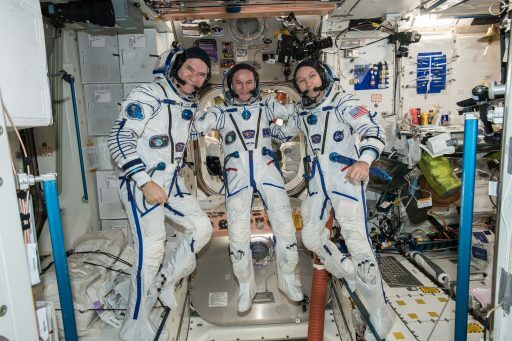 In the confined space of the Soyuz, the three crew members donned their Sokol Launch and Entry Suits while keeping an eye on leak checks and moving through the procedure of transitioning Soyuz to autonomous power and radio communications, allowing electrical hard-line interfaces to be disconnected. Making his second return aboard Soyuz, Sergei Ryazanskiy was at the controls inside the Entry Module, sitting in the center seat with first-time Soyuz flier Randy Bresnik in the ‘co-pilot’ position in the left seat and Paolo Nespoli in a supporting role from the right seat. Strapped in, the crew went through the setup of flight controls for the free flight and checked their suits for leaks to ensure they could fulfill their function of protecting the crew as a last line of defence in case of a cabin depressurization while still outside the atmosphere. 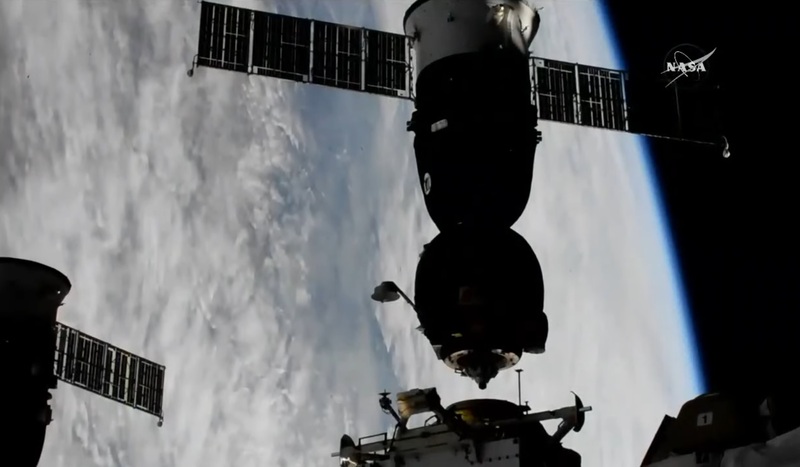 In a departure from recent procedure, ISS handed control over to the Russian Segment for a 90-degree pitch-up maneuver to point the Soyuz toward the velocity vector for a simple departure requiring only one maneuver by Soyuz. To save fuel, ISS did not re-orient for most recent Soyuz undockings which made use of a modified two-burn departure profile. Powering up its SSVP docking mechanism, Soyuz MS-05 began driving open hooks upon receiving the undocking command at 5:13:00 UTC to set up for the spring-loaded separation exactly 90 seconds later as Soyuz pushed off the 410-metric-ton Space Station. Soyuz then drifted away passively at a speed of just 0.1 meter per second before re-enabling its thruster system for a half-minute, 0.67-meter per second departure maneuver to significantly speed up its opening rate. 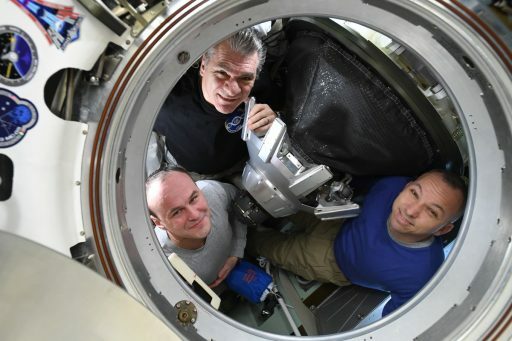 The three crew members remaining aboard ISS wished their colleague and friends a safe return via the space-to-space communications link between the two spacecraft as Soyuz departed the ISS Approach Ellipsoid, set to open a gap of 12 Kilometers over the course of two and a half hours of free flight. Communication channels were quiet while the crew enjoyed their last lap and a half around the planet before pressing into preparing Soyuz for its high-speed return. Having swung into a tail-first orientation, Soyuz MS-05 – flying under the call sign Borei – fired up its SKD main propulsion system at precisely 7:44:59 UTC to hit the brakes and transition the spacecraft from a 400-Kilometer orbit onto a downward arc piercing into the atmosphere at a pre-determined location to carry Soyuz to its planned landing site. The four-minute and 40.7-second retrograde firing of the 300-Kilogram-force engine was right on the money, slowing the vehicle by 128 meters per second. Entering a half-hour free fall toward the atmosphere, Soyuz began accelerating again to 7,618 meters per second at the moment of entry interface. Immediately after conclusion of the deorbit burn, Soyuz opened a valve to vent the Orbital Module down to vacuum to prevent an explosive release of air at the point of module separation. A series of bangs shook the Soyuz at 8:12:13 UTC when the spacecraft was 140 Kilometers in altitude above the Red Sea and fired pyrotechnics to jettison the Orbital and Service Modules that are not equipped with heat shields and were facing a fiery re-entry toward an impact point 830 Kilometers short of the landing site. With the SM/OM departing into opposite directions, the 2.24 by 2.17-meter Entry Module fired up its Hydrogen Peroxide thrusters to enter the proper orientation for re-entry, facing the heat shield toward the direction of travel. Approaching its landing site from the south-west, Soyuz MS-05 passed directly over Iraq’s capital Baghdad and moments later hit the atmosphere when dipping below 100 Kilometers in altitude over the Iranian border at 8:16:36 UTC – starting a 22-minute process to slow down to a complete stop. Soyuz held a pre-programmed orientation for the first 91 seconds of re-entry while atmospheric density was not yet high enough to slow the spacecraft down and only the slightest sensation of gravity could be felt by the crew. As active guidance kicked in around 80 Kilometers above the Caspian Sea, Soyuz entered a series of bank maneuvers to bleed off energy while actively modifying lift on the capsule to control the downrange travel distance toward the desired parachute opening point. Slamming into the dense atmosphere, Soyuz endured temperatures of up to 1,600°C as its ablative heat shield slowly burned away to protect the spacecraft by creating a colder boundary layer of gas between the extremely hot shockwave layer of crushed air in front and the spacecraft. The windows were glowing bright yellow by this point in the descent and Soyuz was fully immersed in plasma, causing a lengthy drop out in communications. 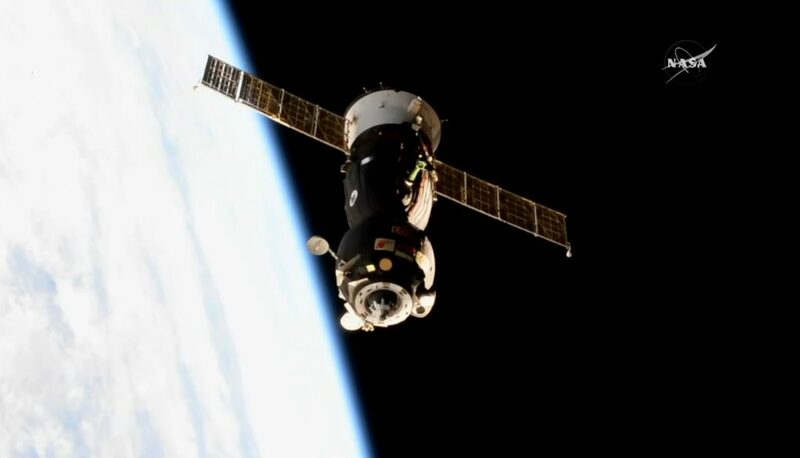 Rapidly decelerating in the dense atmosphere, Soyuz and its crew pulled 4.09Gs when emerging from the plasma blackout some 33 Kilometers in altitude, still around 100 Kilometers from the landing site and traveling 2.1 Kilometers per second. 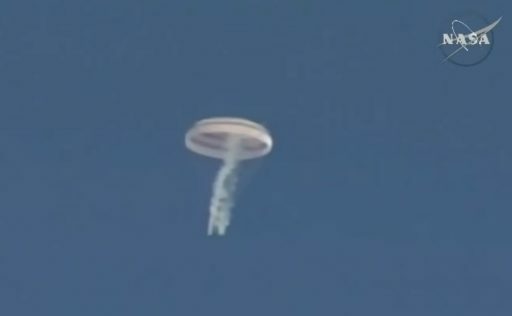 Slowed to 218 meters per second by atmospheric friction, Soyuz blew its parachute cover and ejected a pair of Pilot Chutes 10.7 Kilometers in altitude to pull out the larger Drogue Chute – sending the crew on a rollercoaster ride as the spacecraft gyrated violently while the drogue stabilized to slow Soyuz to 80 meters per second. 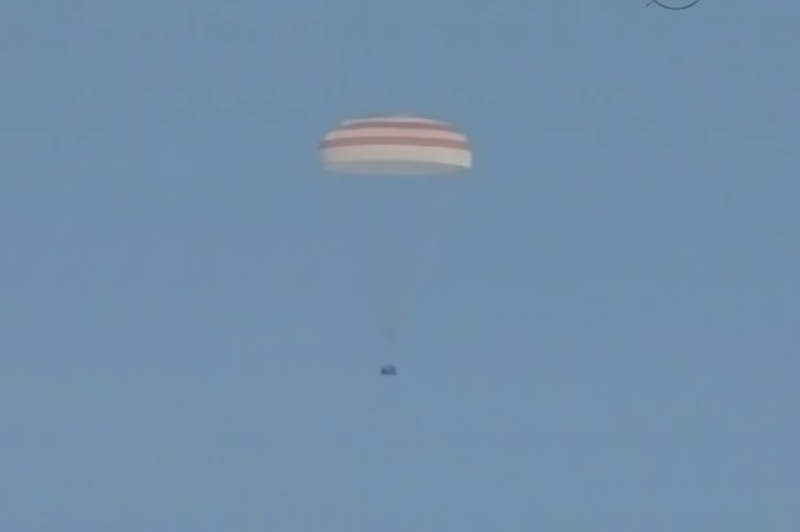 The single main chute deployed 7.5 Kilometers in altitude to transition Soyuz into a vertical descent and kick off the automated landing program that saw Soyuz drop its heat shield to expose the gamma-ray altimeter and landing engines, vent residual Hydrogen Peroxide from its tanks, equalize the cabin pressure and lift the crew seats toward the instrument panel for shock-absorbing purposes. Having enjoyed a flawless atmospheric entry, Soyuz approached the big finale of its journey as it descended through crystal clear skies, swaying under its main chute with landing winds around 30 Kilometers per hour. 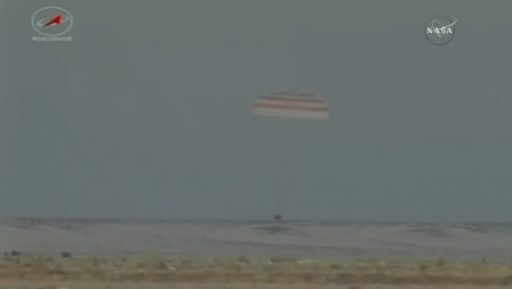 Soyuz blasted its solid-fueled soft landing engines when its altimeter sensed touchdown was imminent to cushion the spacecraft’s return to Terra Firma. Soyuz landed at 8:37 UTC in the planned landing zone 147 Kilometers south east of the remote town of Zhezkazgan, coming to rest in an upright position, standing in around ten centimeters of snow after a mission of 138 days, 16 hours and 56 minutes. Within moments of touchdown, a 300-strong recovery team deployed to the landing area began fighting their way through the snow to reach the landed Soyuz in all-terrain vehicles while helicopters began landing in order of priority to begin the process of extracting the crew. 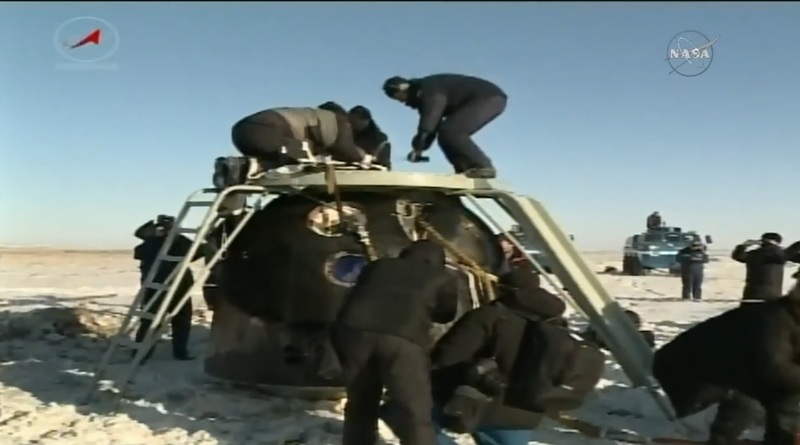 Proficient at working in all weather conditions, recovery personnel from Roscosmos, Soyuz-builder RSC Energia and Rosaviatsia specialists braved the extremely cold temperatures and opened the hatch to the spacecraft just minutes after it had landed. 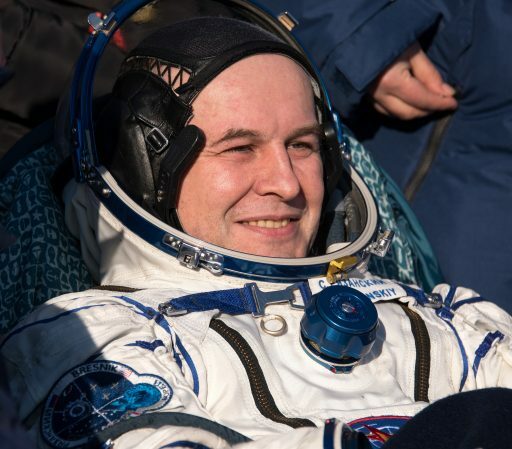 Greeted by the ice cold air of a typical winter day in the Kazakh steppe, Commander Ryazanskiy was first to be extracted from the Soyuz spacecraft, appearing in good condition after closing out his second long-duration space flight, now with 306 days spent off the planet. Paolo Nespoli, now a veteran of one Space Shuttle and two Soyuz missions, spent 313 days in space, also appearing in good physical condition after being extracted from the Soyuz. Last out of the Soyuz was Randy Bresnik after his first long-duration space flight, having logged 150 days off the planet on a Space Shuttle mission and Soyuz MS-05. 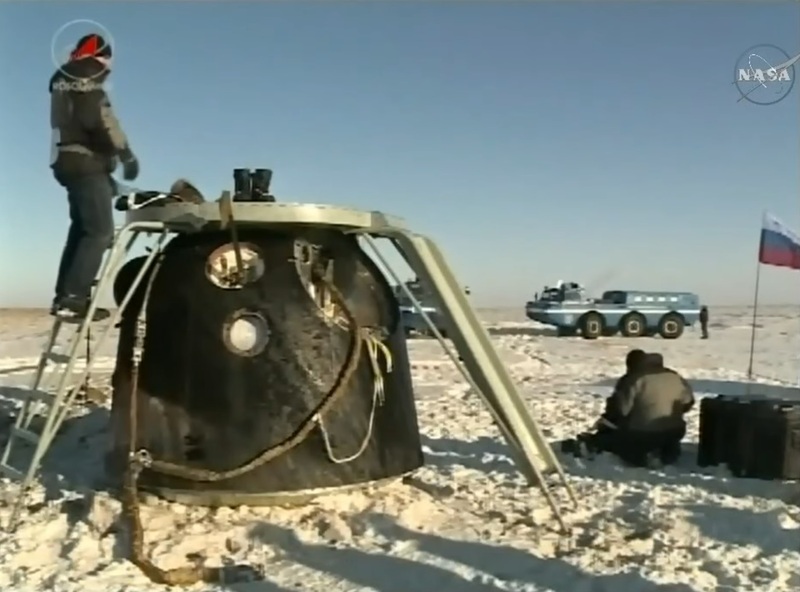 Given the very cold temperatures, the usual procedure of having the crew sit in reclining chairs next to their Soyuz was sped up and they were taken into the Medical Tent for the Field Test Experiment before an expedited return to the city of Karaganda. There, the crew will part ways as all three are headed for different destinations – Sergey Ryazanskiy will fly to Moscow to return to the Gagarin Cosmonaut Training Center for post-flight operations, while Randy Bresnik and Paolo Nespoli will fly to Ellington Field to return to the Johnson Space Center to enter rehabilitation and post-flight science at the European Astronaut Center. With a rapid crew rotation in full swing, focus will now shift to the Baikonur Cosmodrome where the Soyuz FG rocket carrying the MS-07 spacecraft will move to the Site 1/5 launch pad on Friday for a final set of checkouts ahead of launch on Sunday. Recovery teams will not get much of a break as they have to relocate to be present under the ascent path of the Soyuz to recover the crew in the unlikely event of a launch abort. The Dragon SpX-13 resupply mission is still working toward launch on Friday to send fresh cargo to ISS before the holidays. If the date holds – pending resolution of an issue on the Falcon 9 second stage – Dragon would arrive at ISS on Sunday, a few hours after Soyuz takes flight. Should more time be needed to clear foreign objects from the rocket’s second stage, Dragon would have to stand down until December 25 due to a period of high solar beta angles.